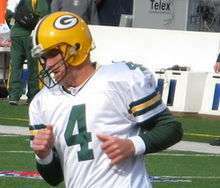 Brett Favre, the all-time leader in consecutive starts by an NFL player. This is a list of the most consecutive starts and games played by a player by position in the NFL. Brett Favre's starts streak of 297 games is the longest all-time. Among defensive players, Jim Marshall's starts streak of 270 is the longest all-time. Of special note is punter Jeff Feagles, who played in 352 consecutive games which is the longest of all-time for a special teams player. Special teams players are not credited with starts in the NFL. In 2016, Lawrence Timmons became the most recent player to surpass someone at his position for consecutive starts, having broken the previous mark for right inside linebackers previously held by Frank LeMaster. London Fletcher, the most recent player to achieve 200 consecutive starts by an NFL player. Eli Manning, the active leader for consecutive starts by an NFL player. 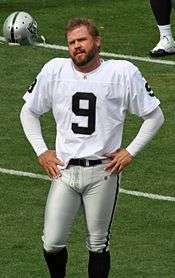 Shane Lechler, the active leader in consecutive games played by an NFL player. 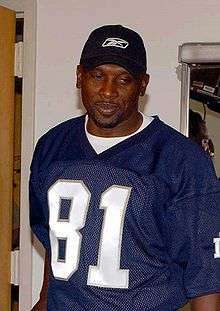 Tim Brown, the all-time leader in consecutive starts by an NFL wide receiver. 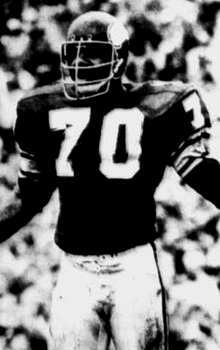 Gene Upshaw, the all-time leader in consecutive starts by an NFL left guard, holds the record for consecutive starts including playoffs to begin a career at any position (231). Jim Marshall, the all-time leader in consecutive starts by an NFL defensive end. 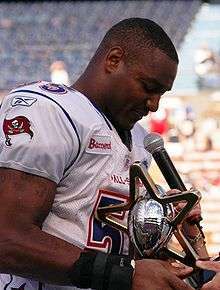 Derrick Brooks, the all-time leader in consecutive starts by an NFL weakside linebacker. Ronde Barber, the all-time leader in consecutive starts by an NFL defensive back. 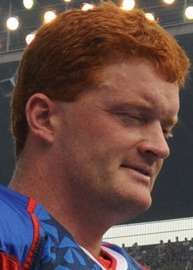 Ethan Albright, the all-time leader in consecutive games played by an NFL long snapper. Note: Games played by special teams players such as kickers and punters are not recognized officially as starts by the NFL. 1 2 3 4 5 Seifert, Kevin. "ESPN.com: Double Coverage: Favre vs. Ripken". Espn.go.com. Retrieved 2012-04-20. 1 2 "Packers.com: Iron-Man Favre To Make 200th Consecutive Start As Packers-Rams Clash On Monday Night Football". nfl.packers.com. 2004-11-24. Retrieved 2012-04-20. 1 2 "Vikings QB Favre 'grateful' after his NFL-record 271st start in a row". NFL.com. Retrieved 2009-09-21. ↑ "Favre's consecutive start streak comes to an end at 297". NFL.com. Retrieved 2010-12-14. ↑ "Feagles feat recognized". Profootballhof.com. 2005-11-27. Retrieved 2012-04-20. 1 2 3 4 "Jeff Feagles - Game Logs". NFL.com. Retrieved 2010-11-11. 1 2 "Lawrence Timmons - Profile". NFL.com. Retrieved 2016-09-23. ↑ "Frank LeMaster - Game Logs". NFL.com. Retrieved 2012-04-20. ↑ "Frank LeMaster Statistics". Pro-football-reference.com. Retrieved 2012-04-20. ↑ "NFL Iron Man Brett Favre finally sits one out". Statesman.com. Retrieved 2011-01-11. 1 2 3 "Brett Favre - Game Logs". NFL.com. Retrieved 2010-12-14. 1 2 "Brett Favre set for tests with streak over". ESPN.com. Retrieved 2011-01-13. 1 2 3 4 "Jim Marshall - Game Logs". NFL.com. Retrieved 2010-11-11. 1 2 "Former Viking Marshall congratulates Favre on iron-man record". NFL.com. Retrieved 2011-01-11. 1 2 3 "Mick Tingelhoff - Game Logs". NFL.com. Retrieved 2010-11-13. 1 2 3 "No. 51 Mick Tingelhoff". Huskers.com. Retrieved 2011-01-13. 1 2 "Bruce Matthews - Game Logs". NFL.com. Retrieved 2011-01-11. ↑ Weir, Tom (2007-08-03). "Iron Man Matthews earns his bronze bust in Canton". USA Today. Retrieved 2011-01-13. 1 2 3 "Will Shields - Game Logs". NFL.com. Retrieved 2010-11-13. 1 2 "Carl Peterson on Will Shields". KCChiefs.com. Retrieved 2011-01-13. 1 2 3 4 "Alan Page - Game Logs". NFL.com. Retrieved 2010-11-13. 1 2 3 "A Page Out Of NFL History". Sports Illustrated. Retrieved 2010-11-13. 1 2 3 4 "Ronde Barber - Game Logs". NFL.com. Retrieved 2013-05-09. 1 2 3 "Ronde Barber retires after 16 seasons". FoxSports.com. Retrieved 2013-05-09. 1 2 3 "London Fletcher - Profile". NFL.com. Retrieved 2012-10-27. 1 2 3 4 "London Fletcher" (PDF). Washington Redskins Media Guide. Retrieved 2013-11-09. ↑ "Jim Otto - Game Logs". NFL.com. Retrieved 2011-01-11. ↑ "HOF: JIM OTTO". Pro Football Hall of Fame. Retrieved 2011-01-13. 1 2 3 "Derrick Brooks - Game Logs". NFL.com. Retrieved 2010-11-13. 1 2 "Ex-Buc Derrick Brooks officially retires from NFL". TBO.com. Retrieved 2011-01-13. ↑ "Peyton Manning - Game logs". NFL.com. Retrieved 2011-09-07. ↑ "Streak ends: Colts' Manning ruled out Sunday; Collins to start". NFL.com. Retrieved 2011-09-07. 1 2 "Gene Upshaw - Game Logs". NFL.com. Retrieved 2010-12-09. 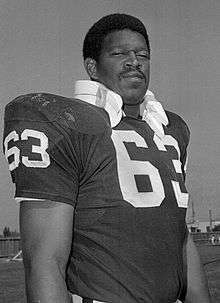 1 2 "HOF: GENE UPSHAW". Pro Football Hall of Fame. Retrieved 2011-01-13. ↑ "Randall McDaniel - Game Logs". NFL.com. Retrieved 2011-01-11. ↑ "HOF: RANDALL MCDANIEL". NFL.com. Retrieved 2011-01-13. 1 2 3 4 "NFL Insider: Greenway, Allen rank high among NFL ironmen". Startribune.com. Retrieved 2013-11-10. 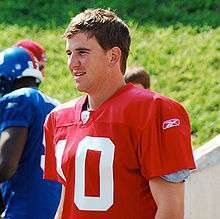 ↑ "Eli Manning - Profile". NFL.com. Retrieved 2013-10-07. ↑ "Philip Rivers - Profile". NFL.com. Retrieved 2013-10-07. 1 2 "Jason Witten - Profile". NFL.com. Retrieved 2014-10-16. 1 2 3 "Joe Thomas will reach 100 consecutive starts on Sunday: Cleveland Browns Insider". Cleveland.com. Retrieved 2013-10-09. ↑ "Joe Thomas - Profile". NFL.com. Retrieved 2013-10-07. ↑ "Jumbotron highlight nearly led Bucs to scrap pass to Donald Penn". NBC Sports. Retrieved 2013-11-15. ↑ "Donald Penn - Profile". NFL.com. Retrieved 2013-11-15. ↑ "Brandon Carr - Profile". NFL.com. Retrieved 2014-09-30. ↑ "Andy Levitre - Profile". NFL.com. Retrieved 2015-10-29. ↑ "Matt Ryan - Profile". NFL.com. Retrieved 2016-09-23. ↑ "Zane Beadles - Profile". NFL.com. Retrieved 2016-11-17. ↑ "Fletcher joins NFL's elite 250 club". Retrieved 2013-11-18. ↑ Pedulla, Tom (2006-09-01). "Feagles' retirement kick ricochets". Usatoday.com. Retrieved 2012-04-20. 1 2 "Giants punter Jeff Feagles retires after 22 seasons and record 352 consecutive games". The Gaea Times. Retrieved 2011-01-13. ↑ "Favre's starts streak ends at 297". ESPN.com. Retrieved 2011-01-27. ↑ "Giants punter Feagles tops Marshall's record for consecutive games played". Spokesman-Review. Retrieved 2011-01-27. 1 2 3 "Morten Andersen - Game Logs". NFL.com. Retrieved 2010-11-13. 1 2 "No. 7 Morten Andersen". New Orleans Saints History. Retrieved 2011-01-13. ↑ "Chris Gardocki - Game Logs". NFL.com. Retrieved 2011-02-11. ↑ "Chris Gardocki Statistics". Pro-Football-Reference.com. Retrieved 2011-02-11. 1 2 "Bill Romanowski - Game Logs". NFL.com. Retrieved 2011-01-27. 1 2 "Q&A with Bill Romanowski". New Orleans Saints History. Retrieved 2011-01-27. ↑ "Ryan Longwell - Game Logs". NFL.com. Retrieved 2012-09-10. ↑ "Vikings Cut Ryan Longwell; Likely to Start Blair Walsh". BleacherReport.com. Retrieved 2012-09-10. ↑ "Jim Bakken - Game Logs". NFL.com. Retrieved 2011-02-11. ↑ "NFL Ironmen". SFGate.com. 1995-09-08. Retrieved 2011-02-11. ↑ "Gary Anderson - Game Logs". NFL.com. Retrieved 2011-02-11. ↑ "Gary Anderson Statistics". Pro-Football-Reference.com. Retrieved 2011-02-11. ↑ "Shane Lechler - Game Logs". NFL.com. Retrieved 2015-12-09. ↑ "TSHOF:Matthews, Bruce". Texas Sports Hall of Fame. Retrieved 2011-02-11. ↑ "Jim Turner - Game Logs". NFL.com. Retrieved 2011-02-11. ↑ "New York Jets Famous Players: Jim Turner". FootballJets.com. Retrieved 2011-02-11. ↑ "George Blanda - Game Logs". NFL.com. Retrieved 2012-05-28. ↑ "GEORGE BLANDA Career Highlights". Pro Football Hall of Fame. Retrieved 2012-05-28. ↑ "John Hadl - Game Logs". NFL.com. Retrieved 2012-05-28. ↑ "NFL Press release about Jim Marshall Day". The Football Search Engine. Retrieved 2012-05-28. ↑ "Dan Stryzinski - Game Logs". NFL.com. Retrieved 2012-05-28. ↑ "Dan Stryzinski Statistics". Pro Football Reference. Retrieved 2012-05-28. ↑ "Former Chiefs' star Shields honored". ESPN.com. Retrieved 2012-05-28. ↑ "Derrick Brooks announces retirement from NFL". TBO.com. Retrieved 2012-05-28. ↑ "Kevin Carter - Game Logs". NFL.com. Retrieved 2012-05-28. ↑ "Former Gator Kevin Carter Named 2010 SEC Football Legend". Gatorzone.com. Retrieved 2012-05-28. 1 2 "Ethan Albright - Game Logs". NFL.com. Retrieved 2011-01-07. 1 2 "Ethan Albright Bio". Redskins.com. Retrieved 2011-01-13. ↑ "Lorenzo Neal - Game Logs". NFL.com. Retrieved 2012-09-29. ↑ "Three Former Bulldogs Inducted Into Hall of Fame". Fresno State. Retrieved 2012-09-29. ↑ "Clyde Simmons - Game Logs". NFL.com. Retrieved 2013-10-22. ↑ "Bears re-sign DE Clyde Simmons to one-year contract". ESPN. Retrieved 2013-10-22. ↑ "Kendall Gammon - Game Logs". NFL.com. Retrieved 2013-10-22. ↑ "Former NFL Long Snapper Kendall Gammon Thrived as NFL Role Player". Bleacher Report. Retrieved 2013-10-22. ↑ "Tim Brown - Game Logs". NFL.com. Retrieved 2010-11-13. ↑ "Tim Brown Statistics". Pro-Football-Reference.com. Retrieved 2011-01-13. ↑ "Walter Payton - Game Logs". NFL.com. Retrieved 2010-11-17. ↑ "George rejects Titans' latest offer, asks for release". SignOnSanDiego.com. Retrieved 2011-01-13. ↑ "TONY GONZALEZ'S LEGACY WILL CONTINUE IN ATLANTA". Atlanta Falcons.com. Retrieved 2013-10-09. ↑ "Jim Brown Statistics". Pro-Football-Reference.com. Retrieved 2011-01-13. ↑ "Jon Runyan - Game Logs". NFL.com. Retrieved 2010-12-09. ↑ "Shawn Andrews out; Eagles work out Jon Runyan". Delco Times. Retrieved 2011-01-13. ↑ "Fred Smerlas - Game Logs". NFL.com. Retrieved 2010-12-10. ↑ "A Wild And Crazy Guy". Sports Illustrated. 1988-11-14. Retrieved 2011-01-13. ↑ "Lee Roy Jordan - Game Logs". NFL.com. Retrieved 2012-04-20. ↑ "Lee Roy Jordan - Alabama Encyclopedia". Encyclopediaofalabama.org. Retrieved 2012-04-20. ↑ "Robert Brazile - Game Logs". NFL.com. Retrieved 2012-04-20. ↑ "Jason Gildon - Game Logs". NFL.com. Retrieved 2012-04-20. ↑ "Jason Gildon Statistics". Pro-football-reference.com. Retrieved 2012-04-20. ↑ "Levon Kirkland - Game Logs". NFL.com. Retrieved 2012-04-20. ↑ "Levon Kirkland Statistics". Pro-football-reference.com. Retrieved 2012-04-20. ↑ "Lawrence Timmons Statistics". Pro-football-reference.com. Retrieved 2016-09-23. ↑ "Schiano wins over Buccaneers by paying respect to veteran Barber". Sport Illustrated. 2012-09-14. Retrieved 2013-02-04. ↑ "Willie Wood - Game Logs". NFL.com. Retrieved 2010-12-09. ↑ "HOF: WILLIE WOOD". Pro Football Hall of fame. Retrieved 2011-01-13. ↑ "Willie Wood Statistics:Right Safety-Left Safety-Free Safety". Pro-Football-Reference.com. Retrieved 2011-01-13. ↑ "Bill Thompson - Game Logs". NFL.com. Retrieved 2010-11-15. ↑ "Bill Thompson Statistics". Pro-Football-Reference.com. Retrieved 2011-01-13. ↑ "Darryl Williams - Game Logs". NFL.com. Retrieved 2010-12-09. ↑ "Darryl Williams Statistics". Pro-Football-Reference.com. Retrieved 2011-01-13. ↑ "Carl Roaches - Game Logs". NFL.com. Retrieved 2010-12-03. ↑ "Carl Roaches Statistics". Pro-Football-Reference.com. Retrieved 2011-01-13.